The Super Fight was a fictional boxing match between Rocky Marciano and Muhammad Ali shot in 1969 and released in 1970. At the time, Ali and Marciano were the only undefeated heavyweight champions in history and fans often debated who would win had they met in their primes. Ali and Marciano were filmed sparring for 75 one-minute rounds producing several possible scenarios for a genuine fight, with the result claimed to have been determined using probability formulas entered into a computer. The final film was only shown once in select cinemas around the world, grossing $5 million from 1,500 theaters across North America and Europe. It was released as a DVD over three decades later. Punch-by-punch details of the boxer's records during their prime were entered into an NCR 315 computer. Also their strengths, weaknesses, fighting styles and patterns and other factors and scenarios that the boxers could go through were converted into formulas. The NCR-315 with 20K of memory was supplied by SPS (Systems Programming Services), an independent service bureau in Miami, Florida. The algorithms were supplied by an NCR mathematician, and programming was done in Fortran by an employee of SPS. Hank Meyer, President and salesman with a one other partner in SPS, was instrumental in setting this competition up, and contended at the time that it was his idea. The actual running of the software was done the night before each broadcast round of the 'computer championship' and took approximately 45 minutes to run, the output was a formatted report containing a series of codes describing each punch. This was then written to magnetic tape, the tape was then manually transferred to a Univac 1005 and printed. This took place in early 1968. The outcomes were then staged as radio plays with Woroner and radio announcer Guy LeBow as the commentators. The fantasy fights were broadcast worldwide. Even the boxers who were still alive at the time listened to the programs and some of them participated as commentators. After the series of elimination rounds, the final fight was between Dempsey and Marciano. Marciano defeated Dempsey and was considered to be the all-time greatest heavyweight champion by the computer. Woroner awarded the real Marciano a gold and diamond championship belt worth $10,000. A cinema ticket for the fictional computer fight pitting Muhammad Ali against Rocky Marciano in 1969. On the back of the radio broadcasts, Muhammad Ali filed a $1 million lawsuit against Woroner for defamation of character, stating his anger at his elimination at the second round to Jim Jeffries, a boxer Ali had previously called "history's clumsiest, most slow-footed heavyweight." The lawsuit was settled when Woroner offered to pay Ali $10,000 whilst also getting his agreement to participate in a filmed version of a fantasy fight in which he would fight Marciano. Ali and Marciano agreed on the condition that they would also receive a cut of the film's profits. Marciano, whose last fight before retiring undefeated at 49–0 was 14 years prior, also agreed to participate with a similar deal. In preparation for the film, Rocky lost over 50 pounds (23 kg) and wore a toupee in order to look as he did in his prime. Both he and Ali were reported to be enthusiastic about meeting each other and getting back in the ring. The same formulas as the radio fantasy fights were used and entered into the NCR 315, with filming commencing February 1969 in a Miami studio. The two fighters sparred for between 70 and 75 rounds, exchanging mainly body blows with some head shots in-between, which were later edited together according to the findings of the computer. Braddock, Louis, Schmeling, Sharkey and Walcott also recorded commentary to be used in the film. The final outcome would not be revealed until the release of the film on January 20, 1970, shown in 1,500 theaters over pay-per-view closed-circuit television in the United States, Canada, and throughout Europe. American and Canadian audiences were shown a version where the computer had determined that Marciano would have knocked Ali out in the 13th round, whilst European audiences were shown another ending in which Ali was depicted the winner by KO also in the 13th round. In the United States, the film grossed more than $2.5 million from more than a thousand theaters. Across North America and Europe, the film grossed $5 million from 1,500 theaters. Three weeks after filming was completed, Rocky Marciano died in a plane crash on the eve of what would have been his 46th birthday. No feedback was recorded from him personally regarding the film, with the exception of Marciano's brother Peter who claimed that upon Rocky being asked whether he would win the fantasy fight, he was confident that he would win. Ali attended a screening of the film the night of the release. He immediately relaunched legal proceedings against Woroner, again stating defamation of character, alleging the film's marketing had misled audiences worldwide to believe the fight was actual, whilst also stating any version of the film which depicted him losing was a result of him not taking the simulation seriously. He also claimed American audiences were left angered by Marciano being depicted the winner and disputed whether the NCR 315 computer was used at all during or after filming. Ali later dropped the lawsuit upon discovering his depicted win in European theatres, whilst also having been made aware of the filmmakers plans to destroy remaining prints of the film to prevent potential legal action. In a 1976 interview, Ali briefly recapped on the film maintaining his ridicule of the style of filming and depicted outcomes. He however praised Marciano as a boxer stating they left filming on good terms. During the buildup to the film's release, concerns were held regarding Ali's ban from boxing being active at the time of the film's conceptualization, recording and release, and were later fueled by allegations that marketing and promotional work for the film did not clearly detail that the fight was fictional and the outcome was decided by the NCR 315 computer as well as opinions of boxing experts. Upon the film's release, believing audiences were misled to believe the fight was actual and Ali threatening a second lawsuit upon Woroner, the producers announced all film prints had been destroyed. Debates subsequently took place over the next three decades as to whether at least one print of film had survived. It was cited that many theaters had continued to play the film long after January 20, 1970, and was also noted that the film had one airing on ABC's Wide World of Sports in 1970, and another on CBS late night in 1977, with many more broadcasts alleged throughout. Following an official discovery of a surviving print in 2005, the film was authorized for release and distribution. 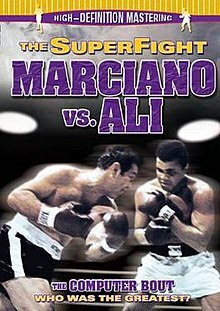 On December 27, 2005, The Superfight: Marciano vs. Ali was released on DVD and has been televised several times since. The DVD includes a documentary about the film, audio of the original radio fantasy fights, archival interviews with the fighters that were chosen, and other features. The Super Fight was featured in and inspired the plot of the 2006 film Rocky Balboa. ^ a b c d "Ali vs. Marciano: Who wins?". The Enterprise. September 1, 2009. Retrieved July 19, 2016. ^ "The forgotten story of … the Rocky Marciano v Muhammad Ali Super Fight". The Guardian. November 13, 2012. ^ Schultz, Brad (November 5, 2015). Lombardi Dies, Orr Flies, Marshall Cries: The Sports Legacy of 1970. Rowman & Littlefield. p. 23. ISBN 978-1-4422-5629-3. ^ Weinstein, Arthur (June 5, 2016). "How Muhammad Ali regretted his strangest fight ever". Sporting News. Retrieved July 19, 2016. ^ Trinklein, Rhaya (October 1, 2003). "Rocky Marciano The Brockton Blockbuster". RockyMarciano.net. Archived from the original on August 20, 2016. Retrieved July 19, 2016. ^ Bingham, Howard; Wallace, Max (2000). Muhammad Ali's Greatest Fight: Cassius Clay vs. the United States of America. M. Evans. p. 218. ^ Sullivan, Russell (2002). Rocky Marciano: The Rock of His Times. University of Illinois Press. p. 286. ISBN 9780252027635. ^ "The Crash of Rocky Marciano's Cessna". Check-Six.com. ^ Christie, Matt (August 31, 2014). "On This Day: Heavyweight great Rocky Marciano dies in plane crash in 1969". Boxing News. Retrieved July 19, 2016. ^ "Superfight: Marciano Vs Ali [DVD] ". amazon.co.uk. Retrieved July 19, 2016. Official site for the DVD. Archived from the original on 2012-02-04. This page was last edited on 7 February 2019, at 19:52 (UTC).